Adamsleigh, the sprawling mansion built in 1929 by textile magnate John Hampton Adams, was sold on November 7th. The Tudor-style estate in Sedgefield will celebrate its 90th anniversary in 2019, but the fate of the house will be decided by its new owners. Architect Luther Lashmit designed Greensboro’s grandest estate located at 3301 Alamance Road on a scale rarely witnessed in North Carolina. The 30,000-square foot house includes grass tennis courts, a gatekeeper’s cottage, and views of the Donald Ross-designed Sedgefield Country Club golf course. 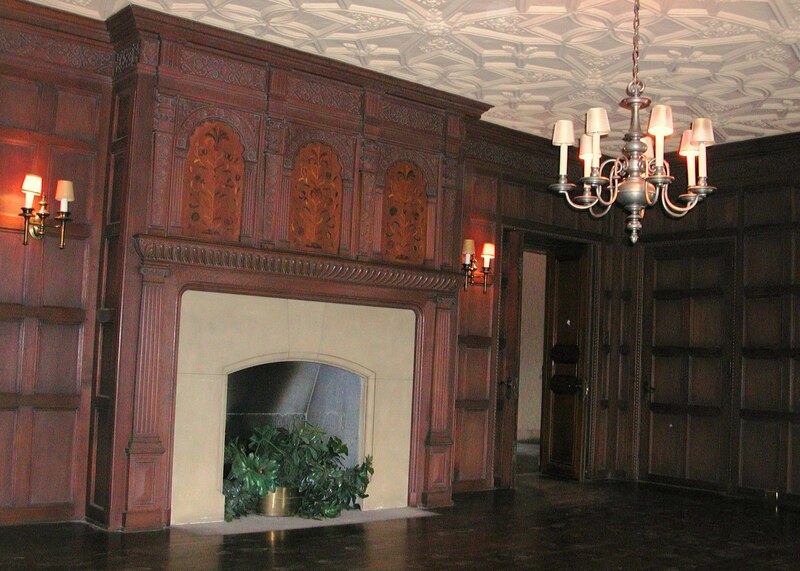 A clay Ludowici tile roof is joined by hand-wrought ironwork, exotic slate and stone, irreplaceable plaster moldings, wood paneling, and lead-glass windows. However, the estate is not without challenges. The scale of the 16-acre site and its asking price of $3,895,000 certainly limited the market for the property. The need for a single-family residence of the scale of Adamsleigh was an additional hurdle. Another challenge is needed investment. The house is in need of upgrades, including HVAC, painting, upgrading the kitchen, and repurposing a vast servant wing for modern uses. Although the house has been vacant for over a decade, it is not derelict. Adamsleigh was the location of a designer showcase in 2013, and it has not suffered the same level of deterioration witnessed by Hillside, a grand house in Greensboro’s Fisher Park neighborhood that was recently restored. These challenges led to placement of Adamsleigh to Preservation Greensboro’s Treasured Places Watch List since 2009. Some hoping for preservation of the estate are frustrated by the lack of legal restrictions available to prevent demolition of the property. Legal scholars and preservationists can verify that many of the tools available to enhance preservation in North Carolina fall short of preventing demolition. National Register designation provides for historic tax credits to make preservation more economically viable, and local landmark designation can require a one-year delay in destruction. Both designations are voluntary for stand-alone properties such as Adamsleigh, and the Adams heirs didn’t seek them. Historic district designations can provide the same tools, but the surrounding Sedgefield neighborhood has not been enthusiastic about historic-district protection. Loss of such important works of architecture is not new to this area. Chinqua Penn Plantation near Reidsville saw architectural features sold to public auction around 2012, and the Shadowlawn estate in High Point’s Emerywood neighborhood was lost to demolition in 2013 after fire damage. Important historic sites such as these can be classified as works of art and a focus of community pride, but, like art, they can be privately owned and subject to the inclinations of their owners. Public records identify the new owners as Jason and Jennifer Harris. Today, Adamsleigh is owned by a family outside the Adams lineage for the first time since construction. The community waits and watches to see if the new owners are the stewards of a unique chapter of North Carolina’s architectural history or the estate’s final chapter.